Yesterday, we tackled another section of the 'Wild Atlantic Way' and drove to the Cliffs of Moher. It hardly rained at all and was quite warm. Yippee! We saw some beautiful sights that made me gasp. It probably was a three hour round trip but it took us a glorious 8 hours because we stopped every thirty minutes to breathe in the scenery or visit a village craft fair or walk along limestone beaches. I wished we could have stopped more often but the roads were so narrow and the speed limits are so fast that there was nowhere to pull over. 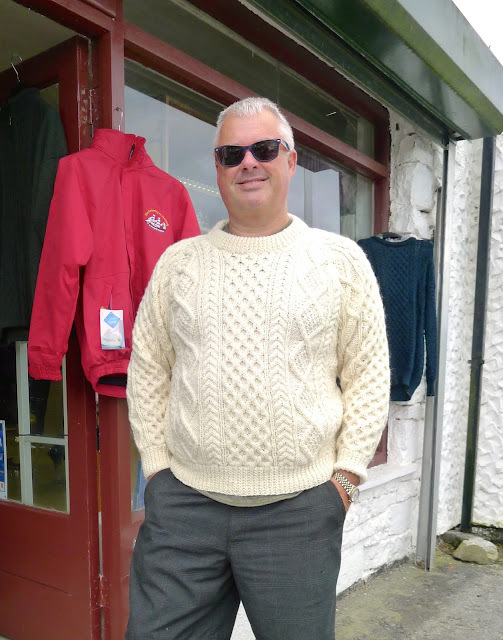 Joe had his heart set on getting a hand-knit Aran Island sweater. He just couldn't wait for our upcoming trip to the Aran Islands on Friday. So we stopped in Burren and he bought this beauty. "Hand knit in her Irish home by Mrs. Delaney." Narrow roads, navigating around parked cars, driving on the left hand side of the road and oncoming tour buses can make driving (and being the passenger) on the 'Wild Atlantic Way' very nerve-wracking! Limestone beaches at Black Head. Rock climbing at Black Head. I wanted to tell them about climbing the Stawamus Chief in Squamish! This little conifer was doing its level best to grow on top of a boulder. There must be thousands of miles of drystone walls in this country. It is quite amazing. Nothing dangerous about doing this! 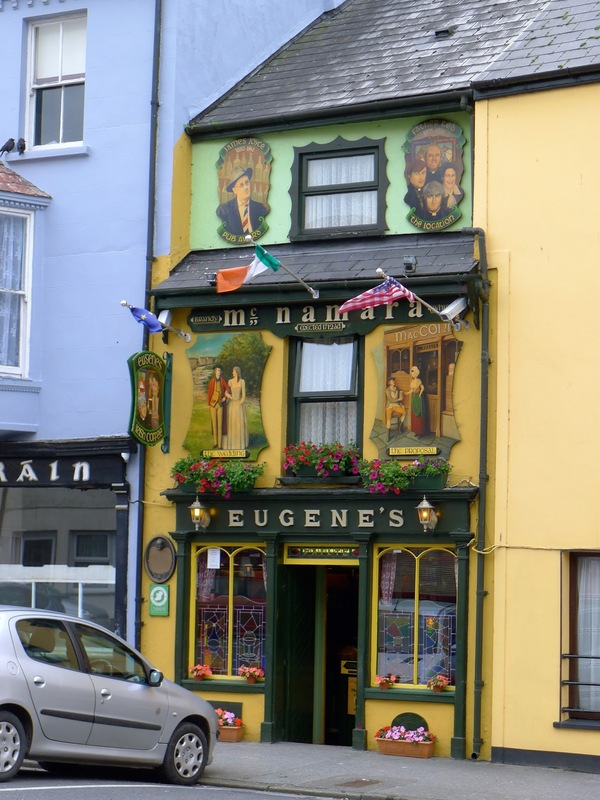 Why can't pubs in British Columbia look like this one in Ennistimon? On our way 'home', we stopped at the Irish Arms in Lisdoonvarna for a pint and a big plate of bangers and mash. A perfect way to celebrate another successful day in Ireland.